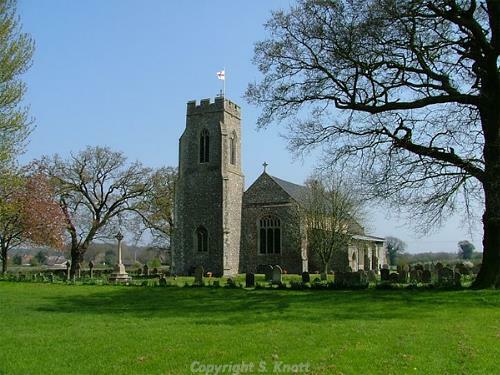 The small parish of Sloley is situated in northeast Norfolk, south of Worstead, north of Tunstead and east of Scottow. Its name comes from the Old English for ‘Blackthorn grove’, and there was certainly an established settlement here by the time of the Norman Conquest, as the parish population, land ownership and productive resources are detailed in the Domesday Book of 1086. There are currently only thirteen records for Sloley, and none that date to earlier than the Roman period. This is not to say that the archaeology is not there, and probably just reflects a lack of detailed investigation; for example, there has been very little reported metal detecting in comparison to other areas in the county. It is to be hoped that knowledge of the parish’s past will increase. Aerial photography has tentatively identified the earliest sites as a Roman field system (NHER 36732) and an enclosure and trackway (NHER 36476), both in the southern part of the parish. Evidence of Saxon occupation is currently limited to one piece of (possibly) Late Saxon pottery (NHER 30510) found east of St Bartholomew’s Church (NHER 7698). Set in a trim graveyard, this neat church has a rather complex anatomy, the interpretation of which is not particularly helped by an over-enthusiastic Victorian restoration. The tower is offset to the north, its base the same date as the chancel, which has a blocked north window and a piscina of about 1300. There were extensions in the 14th century and then a massive rebuild in the 15th century, when the arcades and clerestory were inserted and the south aisle, south porch and the top of the tower added. At this time the chancel arch was moved south and is now off-centre. The south aisle is larger than the north in order to accommodate an altar tomb to Oliver le Gros, Lord of the Manor, who died in 1439. Other internal features are some 15th century carved bench ends, 17th and 18th century floor tombs, 19th century box pews and a two-decker pulpit and 18th and 19th century monuments, some in Gothic Revival style. The real treasure, however, is the superb 15th century octagonal carved stone font, showing the seven sacraments and the Baptism of Christ. It is one of the best examples to be found anywhere in the county. Other medieval buildings have not survived, but have left clues to their former presence. Survey fieldwork on Oldyards Meadow in 1993 (NHER 29501) noted broad linear earthwork ridges forming an irregular platform area. A further enclosure can be seen as a cropmark on a 1946 aerial photograph. Medieval pottery and brick fragments and pieces of post medieval pottery were recovered from adjacent land in 1996. The most likely explanation for these features is that they are a group of enclosures on the common edge which probably had buildings on them in the medieval period. Fieldwalking east of St Bartholomew’s Church in 1982 recovered Saxon, medieval and post medieval pottery fragments, together with pieces of medieval brick and tile (NHER 30510). Also found were parts of medieval curfews, perforated pottery implements placed over domestic fires at night for safety, to contain but not put out the embers. The general scatter of pottery, lines of mortar and patches of clay have led to suggestions that buildings once stood here. Of the post medieval buildings in the parish, Sloley Old Hall (NHER 7693) is probably the earliest, supposedly having 16th century origins, though there is no external evidence for this. The main block is of two storeys, thatched, with four window bays and a central Classical doorway, with a shaped gable of the 17th century to the east. The brick façade seems 18th century. The two storey west extension of two bays is also 18th century and thatched. The important farm buildings on the estate include three barns (two 18th, one 19th century) and the Colt Hall, a building of 17th century origins; there is also a working forge. To the west of the Old Hall is Manor Farm (NHER 13089), a 17th century and later two storey thatched timber-framed farmhouse, now a pair of cottages. It was partly clad in brick in the 18th century, then again in the 19th century. Surrounding the former farmhouse are 19th century farm buildings. Further south is the later Sloley Hall (NHER 7694), a polite and restrained two storey grey brick house of 1815, built for Benjamin Cubitt to a design by his brother-in-law the Reverend James Gunn, a local amateur architect. The east façade has five window bays and a central Classical porch. To the north is a lower two storey service wing. Running north to south in the eastern part of the parish is the East Norfolk Railway Cromer Line (NHER 13586). Work on this began in 1867, and was designed to create a route from Norwich to Cromer. It opened at North Walsham in 1874, at Gunton in 1876 and finally at Cromer in 1877. The line is still in use today. The most historically recent record is NHER 18652 in the south of the parish, the site where a Mustang fighter from an RAF Polish squadron crashed during a training flight in 1945. The spot was excavated in 1982 and the aircraft's engine, together with an undercarriage leg, machine gun and radio were recovered.